The physical presence of the bowhead whale (Balaena mysticetus) is immense and powerful—almost beyond human comprehension. It grows up to 66 feet long with a massive head making up one-third of its body. Its mouth can be 16 feet long and its tongue weighs one ton. The bowhead is insulated with nearly two feet of blubber! It has a forehead so powerful that it can smash through up to two feet of ice to take a breath. Believed to be one of the oldest mammals on earth and with one of the longest life spans (more than 100 years), the bowhead is the only whale that spends its entire life in Arctic waters. This significantly restricts its range and viable habitat. 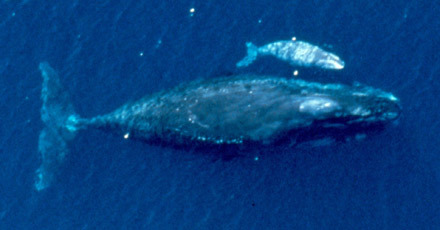 Additionally, the bowhead’s reproductive cycle is long—females only give birth to one calf every three to four years. These factors increase the risks to this already vulnerable species. For centuries, bowheads have been integral to the life of Arctic natives. They have used parts of the whales for food, implements, construction, and even art. President Obama’s Commission on the BP Deepwater Horizon Report stated: “[Bowhead whales] are the most important subsistence animal for the coastal communities of northwest and northern Alaska…No other communal activity involves as high a level of participation. Many coastal Inupiat are strongly opposed to offshore drilling, largely because it can interfere with the migratory patterns and well-being of the bowhead whale.” Subsistence harvest is regulated by quotas set by the International Whaling Commission and enforced by the Alaska Eskimo Whaling Commission. Bowhead whales should be an Endangered Species Act success story. Following the prohibition of commercial whaling, its population rebounded. But, the introduction of oil development off the North Slope of Alaska created a new and dire threat, seriously hindering the progress that has been made in their recovery. The primary threat to the bowhead is oil and gas development off Alaska’s northern coast—with the potential of a spill, increased noise, or deadly collisions with ships the bowhead’s population is increasingly threatened. The bowhead’s habitat is also affected by global warming which is melting their icy home and reducing their food supply. Secondarily, despite a moratorium on non-native hunting, illegal whaling still occurs. The Bureau of Ocean Energy Management, Regulation and Enforcement (BOEMRE) admitted that a very large spill could occur from drilling in Beaufort or Chukchi Seas if oil drilling is allowed to proceed. Despite this fact and the lack of adequate cleanup processes and technologies for oil spills in the Arctic sea ice environment, BOEMRE has conditionally approved a number of permits for Shell Oil’s plan to drill in the Arctic Ocean as soon as summer 2012.